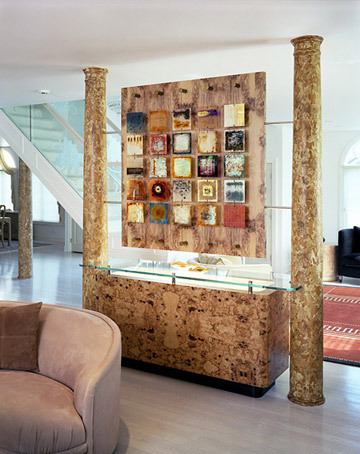 The base cabinet of this custom designed art display unit, is a storage system with a sandblasted glass top, with a light underneath to create a light box effect. A glass shelf floats above this lighted area for display. Structural columns support the artwork and have been plastered and faux painted to create an old world contrast to the modern art panel.